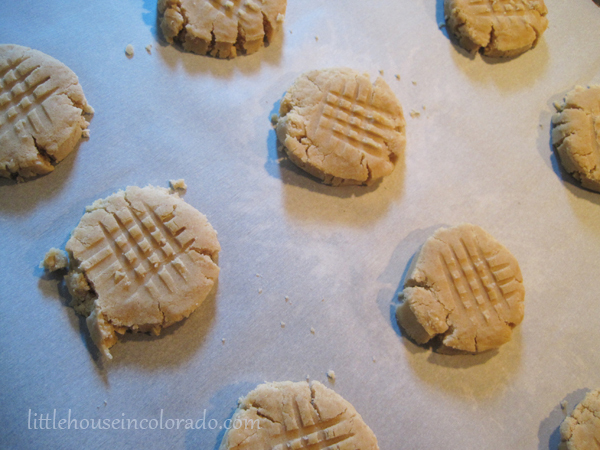 I was excited to try this recipe because I love love LOVE peanut butter cookies. 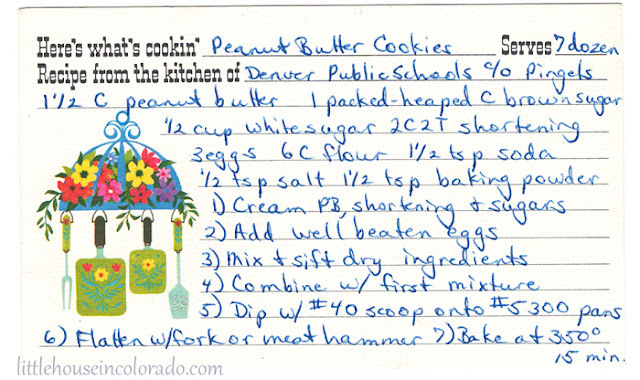 And since this was a public school recipe, well…one thing school cafeterias always got right back in the day were desserts. However… The results were a bit disappointing. 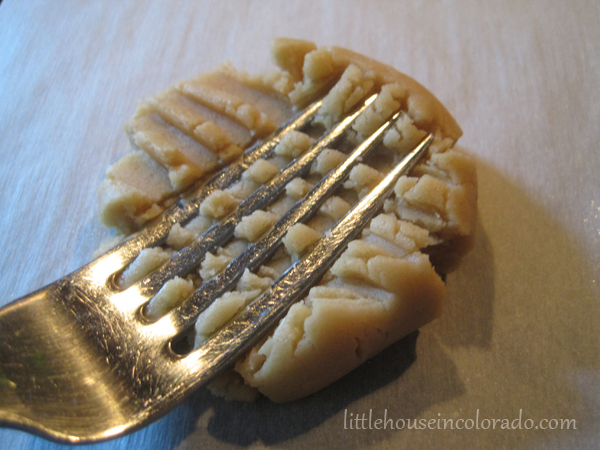 The cookie dough was super dry and crumbly…even before being shaped and baked. I checked the recipe and checked it again thinking perhaps I missed something. Maybe I misread something. Then I thought maybe the dough was SUPPOSED to be that way…so I continued on. 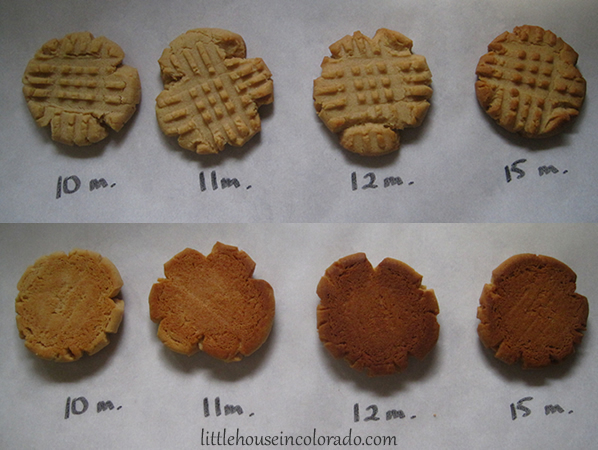 I could barely make the crisscross design on the cookies without them falling apart. And after baking, the resulting cookie just made me NEED a glass of milk to wash it down. Nice peanut buttery taste but SO DRY! So I started over. This time stopping at 5 cups of flour. See how the dough looks much more workable? I could easily scoop (just over a 1 TBS measuring spoon per cookie), roll them into balls and flatten them with the crisscross pattern. This batch of cookies was MUCH better! They were still on the crumbly side (I prefer my peanut butter cookies to have some chew), but my 17 year old devoured 5 of them as soon as he came home so I guess that means they pass. 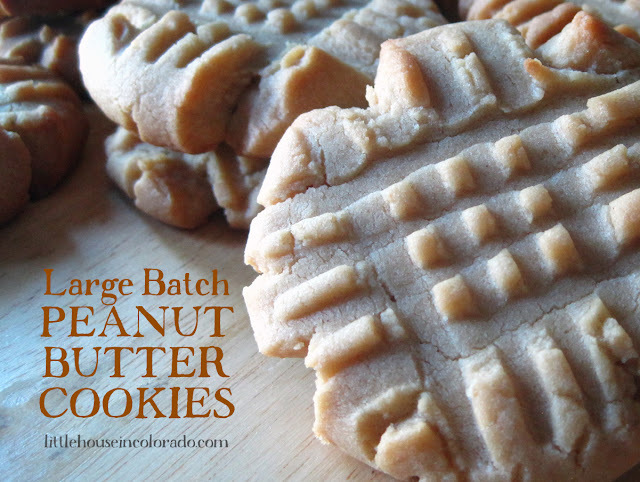 I think perhaps they may be even better if the quantities of shortening and peanut butter were switched. And maybe a teaspoon of vanilla added…but then that makes it a whole new recipe, doesn’t it? The original recipe has been scanned and is transcribed below. It can be printed for use in your own home kitchen. 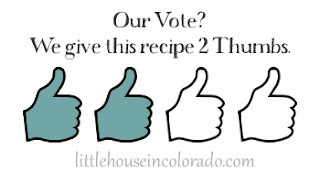 The “recipe notes” section mentions the reduction of flour to 5 cups. Enjoy! 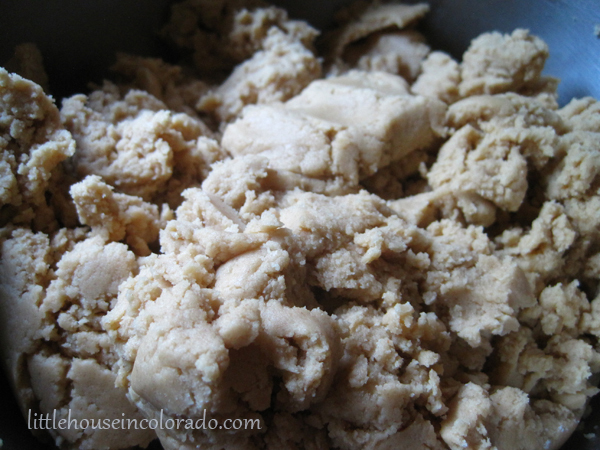 Cream together peanut butter, shortening and sugars. 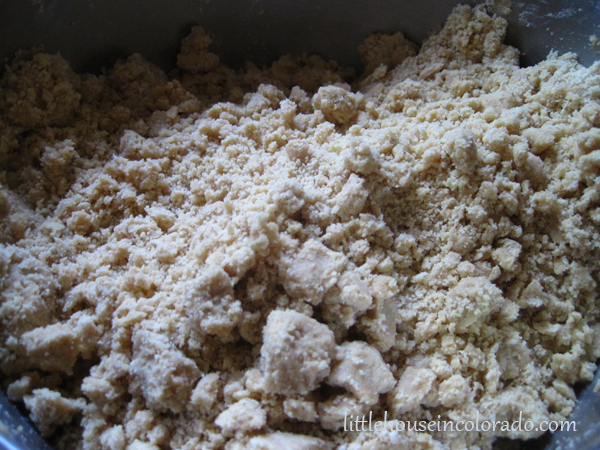 Mix and sift dry ingredients together. Combine with first ingredients. Dip with #40 scoop (1 1/2 Tbs.) onto #5300 pans (a regular cookie sheet is fine). Flatten with fork or meat hammer. The original recipe calls for a #40 scoop and a #5300 pan. - A #40 scoop is equivalent to 1 1/2 Tbs or a well rounded Tablespoon. When making this, I found 6 cups of flour to be WAY too much and preferred it with only 5 cups of flour. I was able to make just under 6 dozen cookies with this change. 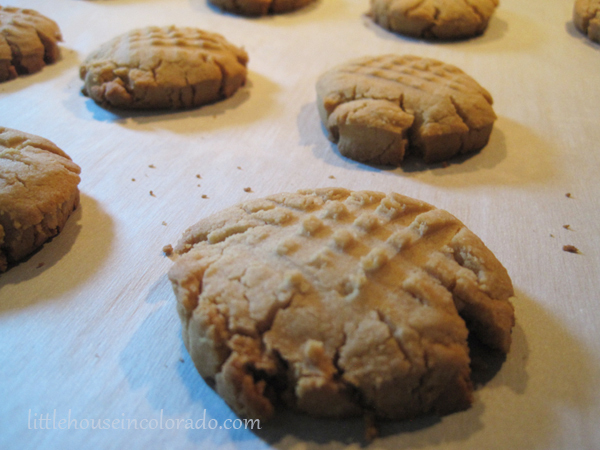 I think perhaps the cookies may be even better if the quantities of shortening and peanut butter were switched and a teaspoon of vanilla added. The original recipe called for baking the cookies for 15 minutes. I experimented with cooking for less time (remember, I prefer chewy cookies) but the 15 minute bake time really produced the best tasting cookie of the bunch. 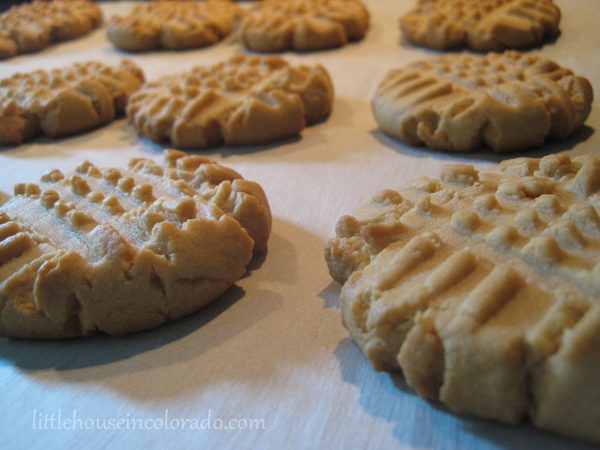 * The cookies were baked on “AirBake” style baking sheets on a layer of parchment paper. I really like this type of pan because it provides a more even bake. The bottoms of my cookies don’t burn before the tops are done. 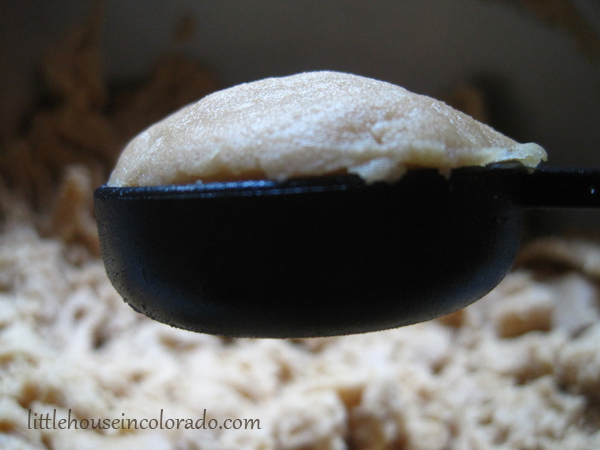 If you don’t have an AirBake pan, you can try layering or nesting 2 cookie sheets together.